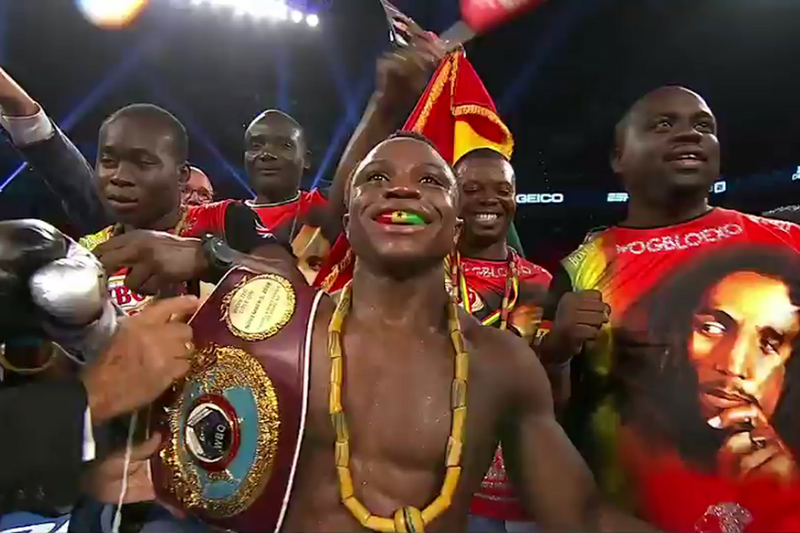 GHANA’S YOUNGEST WORLD CHAMPION, ISAAC ‘The Royal storm’ DOGBOE, 23, IN AN ECSTATIC POSE, MOMENTS AFTER HIS R11 TKO OVER JESSIE MAGDALENO TO CAPTURE THE WBO SUPER BANTAMWEIGHT TITLE IN PHILADELPHIA, LAST SATURDAY. Marrero came back from a KO loss in as stellar a fashion as one can, when he took out Jorge Lara with precise devastation on Saturday night in Texas, and on Fox. The Dominican slid right, and found the lane for a slingshot left. That blow had the 29-0 Mexican reeling like a sailor on leave who found a bar selling 2-for-1 tequila shots. Marrero is a bomber, zero doubt, and will be in line for a title shot somewhere right quick. Tight fight, this main event on HBO. I expected a Jacobs rubout, to be frank. Sulecki found the best version of himself, which, I dare say can often happen when fighters ascend to their career-defining test. 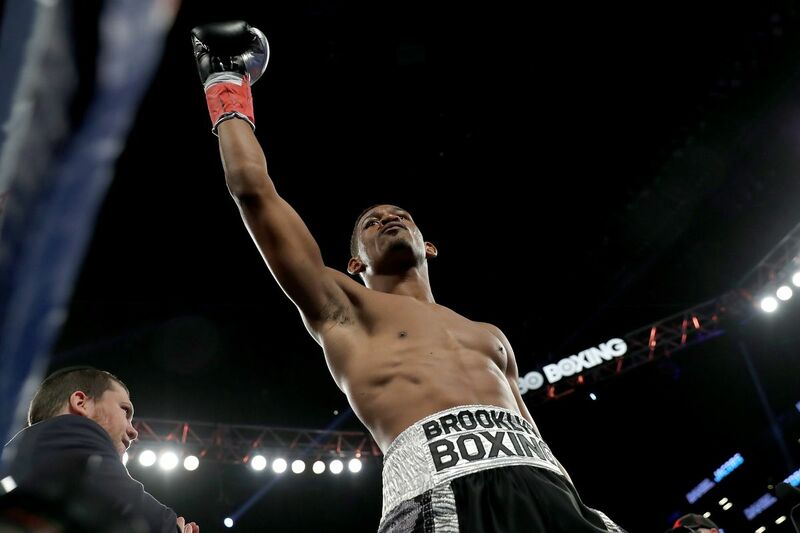 Jacobs boxed smart and I found myself wishing he’d taken more risks in earlier rounds, as he did in the 12th, when he got a bit fervent and nasty. But meanwhile, he keeps winning, and is line for a buzzier fight in his next outing. Yep, this round featured what I thought I’d be seeing more of early on. But Jacobs I think figured out pretty early that the Pole had earned that 26-0 record, and wouldn’t be able to be erased easily. Stevenson has grown leaps and bounds in the last six months, and he was already starting out at a high-level spot. Witness his confidence level on display after the Saturday win? The kid says he’s the best prospect in the game, and you have to love that clarity of identity. Hindsight, you sonofagun. Maybe Magdaleno would have liked to take a rust shedder before stepping in with the Ghanaian boxer for his first fight back in a year. Dogboe is a patient assassin, willing to work the late shift to get you to where he wants you. And that’s a tough task to handle at any time, let alone after a long layoff. Jeeze imagine, what he’ll do if he loses 30-40 pounds, as seemingly everyone on Twitter is asking him to do? People are fixated on this guys’ weight; I’d love for him to stay at this size and keep winning and shut em all up, do it for the jumbos everywhere! “Absorbent,” Compubox, is some winning phrasing! Once again, note his number. That won’t shut up people who want more and better. The way to shut them up is by getting a stoppage, but that isn’t the Miller way. So, he can keep doing what he’s doing and enjoy the checks and march up the ladder.